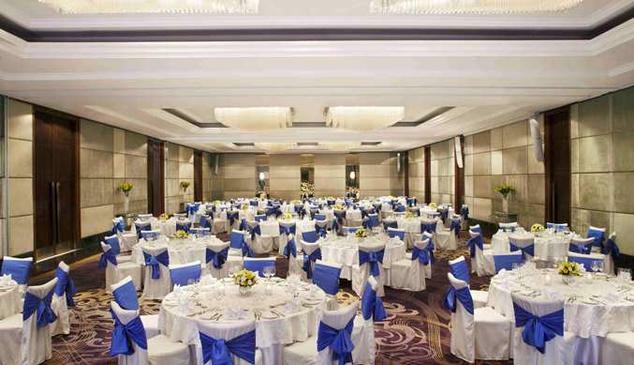 The hotel Double Tree by Hilton is based in the business centre of Eastern Delhi, Mayur Vihar. This hotel just like its name suggests The Double Tree, has two buildings, each adjacent to the other. 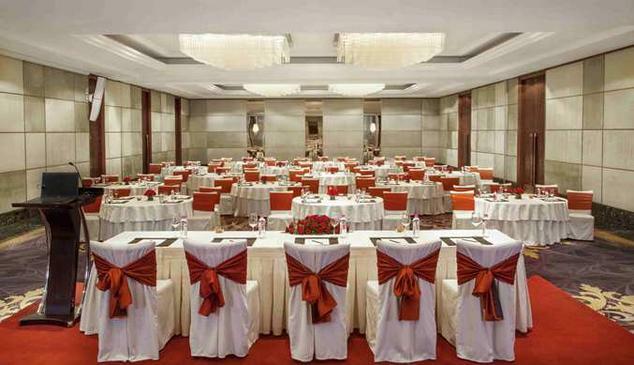 This grand property is very much ideal for business guests as well as for leisure travellers. 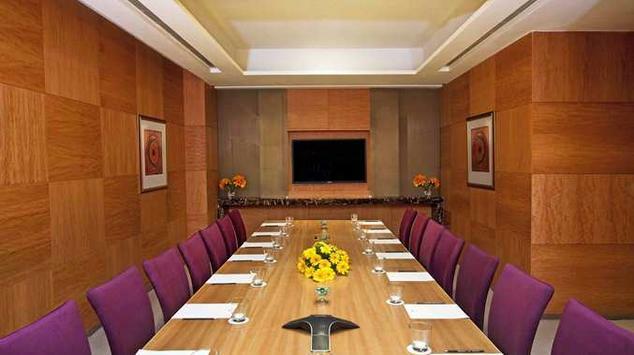 The hotel has 193 rooms and many business facilities like the board rooms, conference rooms and is located near the business hub of Noida. 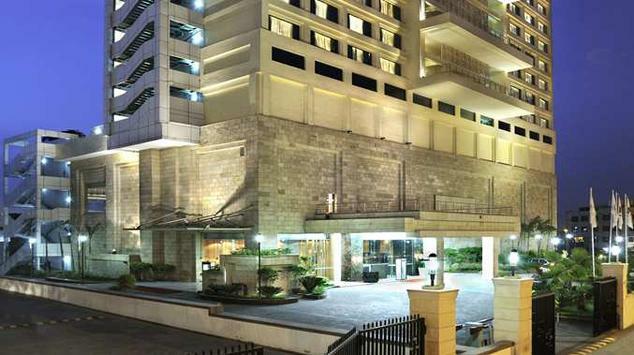 Also Pragati Maidan, Nehru Place and other business districts are not very far away from this hotel site. It also has many shopping malls and movie theatres around it, even the nearest metro station is only 500 metres away from the hotel. Double Tree is very popular for its warm and delicious welcome Cookie trend. It aims at offering a very friendly, comfortable, luxurious and convenient stay over for their guests. 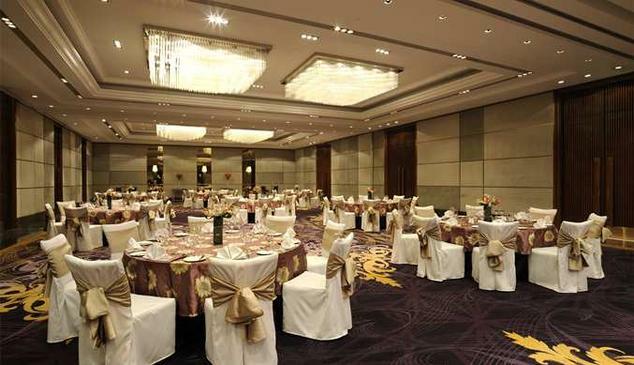 The staffs too are taught to focus on every minor detail to fulfil every wants and needs of the guests. 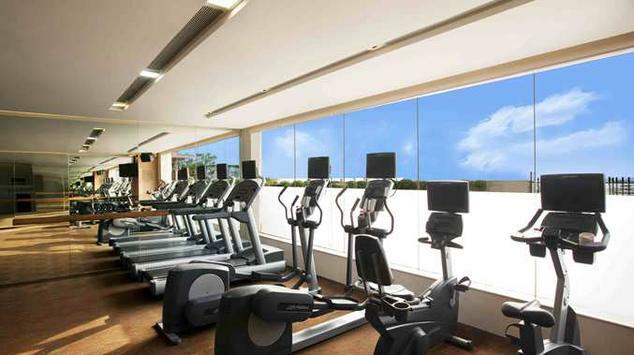 This elegant hotel offers facilities like the Currency Exchange service, laundry service, dining options, complimentary Wi-Fi connections, a personal locker, banquet, parking, travel desk and a business centre. 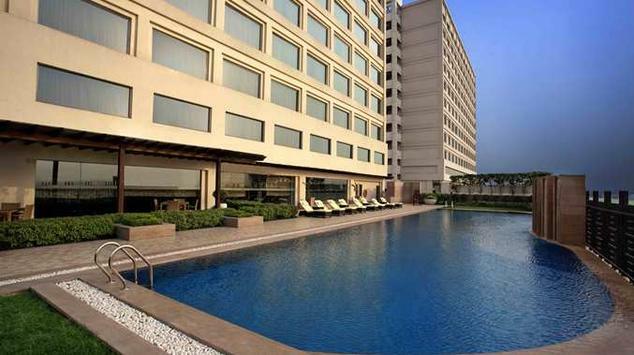 Besides these, the Hotel has an amazing outer pool to help you relax and a spa to indulge yourself. 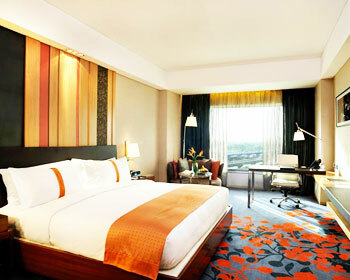 This luxurious room is spacious, comfortable and classy. 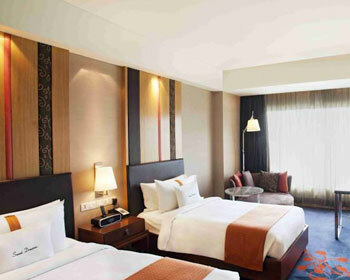 It has a huge plush King sized bed produced by Double Tree especially for a good night’s sleep, enveloped with rich fabric linens. The work desk too designed and put together to add more comfort to the room. The hotel provides other amenities like a 32 inches tall flat screen LCD, satellite connection, MP3 alarm clock for music lovers, a high speed internet and a private impeccable bathroom. The bath has a private shower, cotton terry towels and complimentary toiletries. This immaculate room features 2 comfy queen sized Sweet Dreams beds by Double Tree designed for a good sleep and the linens, the curtains are rich, fresh and welcoming. One can enjoy the TV programmes in a 32 inches LCD connected with a cable service, MP3 for listening music and a high speed internet service. This room has the comfort of a personal luxurious bathroom complimented with fresh cotton terry towels, toiletries and a rain shower. This guest room also has a large window to enjoy the view of the city. This splendid 24 hours open brassiere and deli in The Double Tree serves all three continental meals. 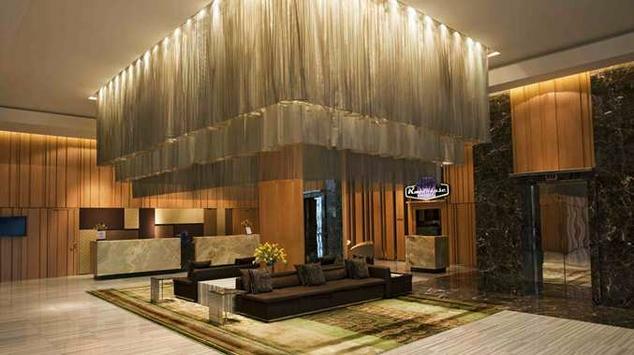 It offers multi cuisines and is an awesome place to relax and hang out with friends. The Cafe on 3 offers the amazing pool view along with delicious Thai food, Western delicacies and North Indian specialities. One can also just sit back and enjoy the yummy burger and sandwiches with fresh juice or other beverages. On Sundays Cafe on 3 serves special brunch with varieties of Mediterranean cuisine, South Indian cuisine, Delhi’s popular chaat, salads, pizzas, etcetera. Live DJ rocks the restaurant in the evening and it also has stalls for face painting and tattoo making for the kids. The Roadhouse Bar & Grill is an American -style restaurant at The Double Tree. It’s a great place for family day out, friends get together and business lunch or dinners. This restaurant serves great wines and its famous signature Long Island Iced Tea. 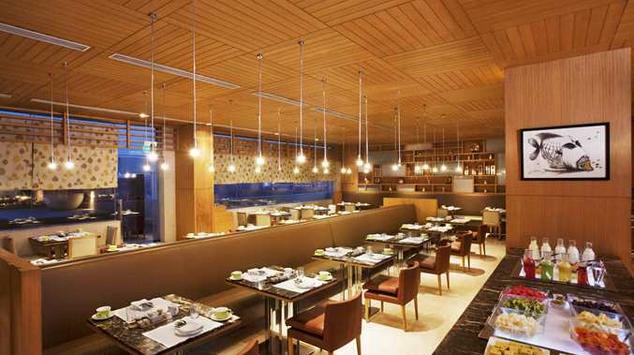 The restaurant specializes in the grilled sea foods, tender juicy steaks and New York inspired burgers. 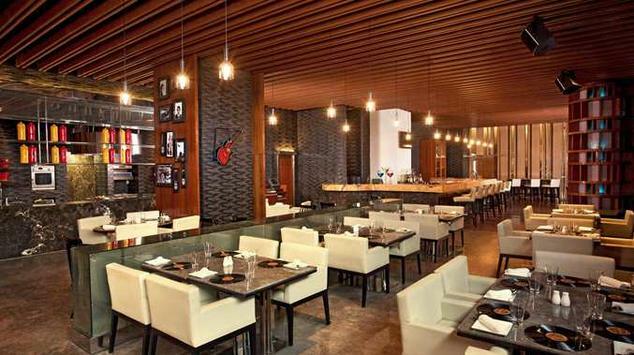 This trendy restaurant also has DJ evenings for the fun loving guests.